Doctors are trying to save Captain Ziv Shilon's right arm. He has regained consciousness. 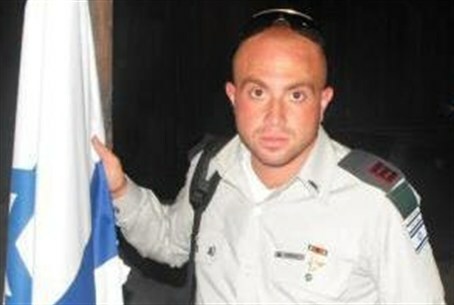 Captain Ziv Shilon, who was badly injured in a Hamas attack near the Gaza security fence Tuesday, regained consciousness Wednesday. He had been unconscious since he was admitted to Soroka Medical Center in Be'er Sheva Tuesday. Doctors are fighting to save his left arm, which was badly hurt in the explosion of a device planted by terrorists. After he woke up, he was visited by Southern Command Head Maj. Gen. Tal Russo. Channel 10 reported that he recognized Russo and even saluted him with his left hand – a gesture that caused Russo to choke up. Dr. Moti Klein, Head of the hospital's Intensive Care Unit, said that Shilon is doing fine and that his bodily systems are in good condition. "If it continues this way, we will stop his life support respiration," he added. A few days after Shilon underwent an operation, Prime Minister Binyamin Netanyahu called his mother, Margalit, to strengthen her spirits and the other members of Shilon's family. "I ask that he will win and live," she told him emotionally. "I have cancer and cannot get out of bed, I ask you to see that he receives good treatment."